December | 2011 | Syed Jahanzaib Personal Blog to Share Knowledge ! 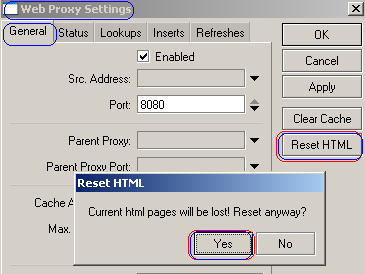 Web proxy is a service that is placed between a client and the internet for HTTP web surfing. 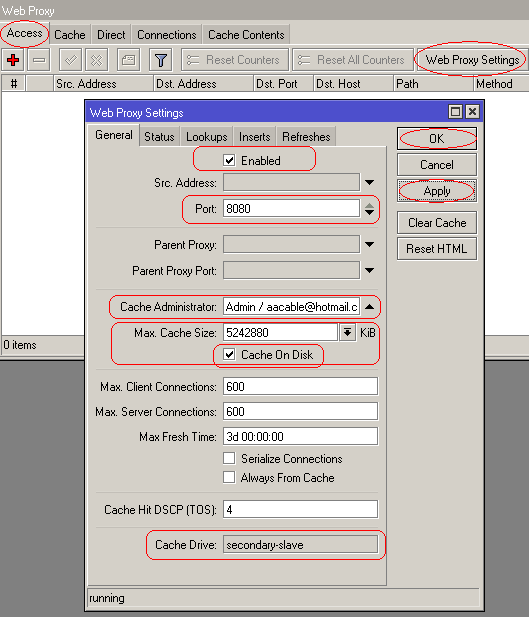 It can cache certain contents / http pages in its local cache. 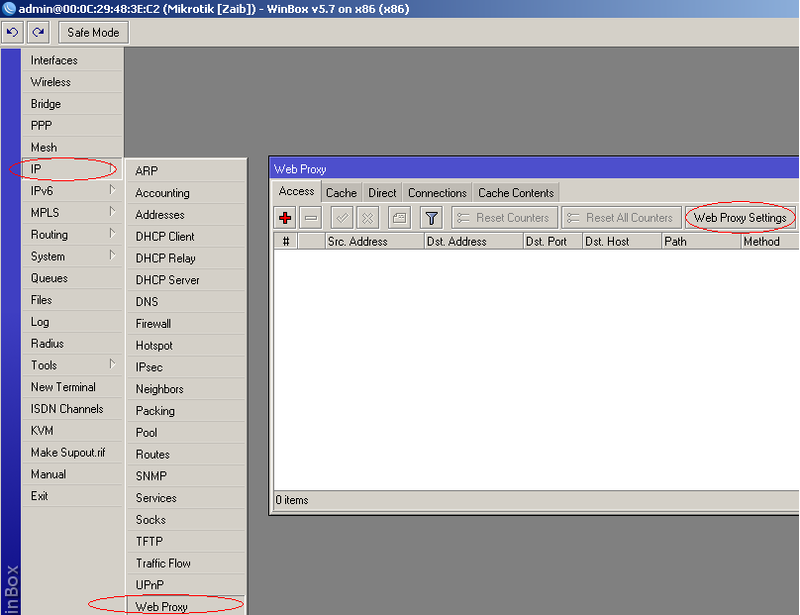 Mikrotik have basic PROXY package builtin called WEB PROXY. It is suitable for basic caching for small to mid size networks. 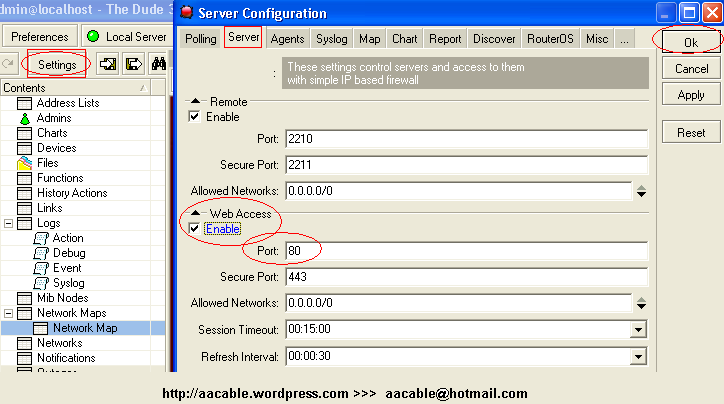 For advance caching capabilities, Use 3rd party external proxy server like SQUID. Always try NOT to use the same storage disk to store your your cache and your your Router OS, to ensure there is always enough space on your router OS Disk for logs, upgrade / update packages & Backups. Therefore It is highly recommended that the web-proxy cache is stored on a physically separate drive (store) other than the Router OS. Placing the cache on a separate drive ensures maximum performance and reduces problems if the disk becomes full or fails as the OS will then still be OK! Caching Internet access will require a lot of read and writes to the disk, chose fast disk as for maximum performance / concurrent user request support. Cache performance also largely depends on RAM size, the More RAM you have in your server, the Better performance you will get. We will divide this article in 3 Sections. 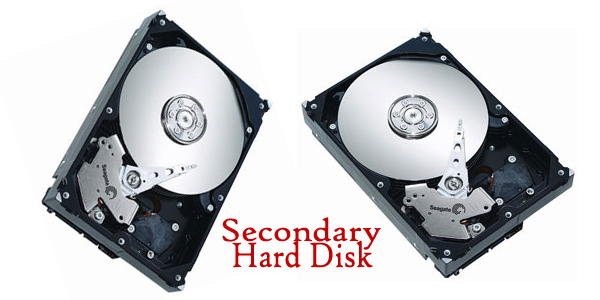 First we will Format secondary harddrive (to be used for cache ), IF YOU DON’T WANT TO USE SECONDARY HARD-DIVE, SKIP THIS STEP. It will ask you where to copy WEB-Proxy package, Select Secondary Drive in TO box. 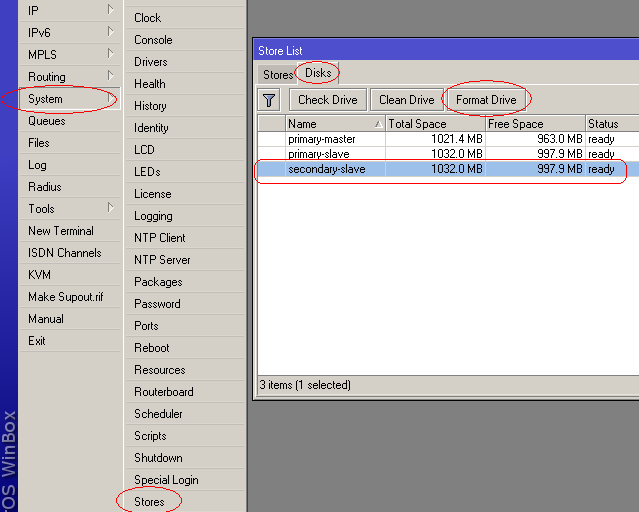 Max Cache Size , Select Unlimited from drop down menu, OR if you have limited Disk Space, then use your desired amount. 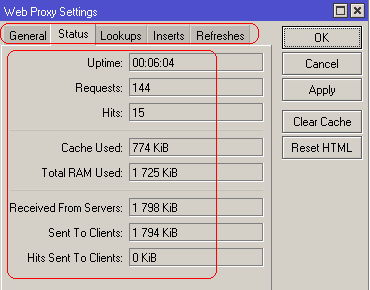 Click on Apply and your Mikrotik’s Web Proxy is Ready to be used, But Every client have to set proxy address pointing to Mikrotik IP to be able to use Proxy Service. If we want that every user must be automatically redirected to Proxy transparently, then we have to create additional rule to forcefully redirect users to proxy service, which is called TRANSPARENT PROXY. Now your newly created rule will look like something below image. OR the CLI version of above rule would be something like below. Done. Now Mikrotik web proxy will perform as TRANSPARENT PROXY , Every user’s HTTP PORT 80 request will automatically be redirected to Mikrotik built-in Web Proxy. You can View Proxy Status and other info via going to IP > WEB PROXY > SETTINGS > STATUS and other tabs in the same window. 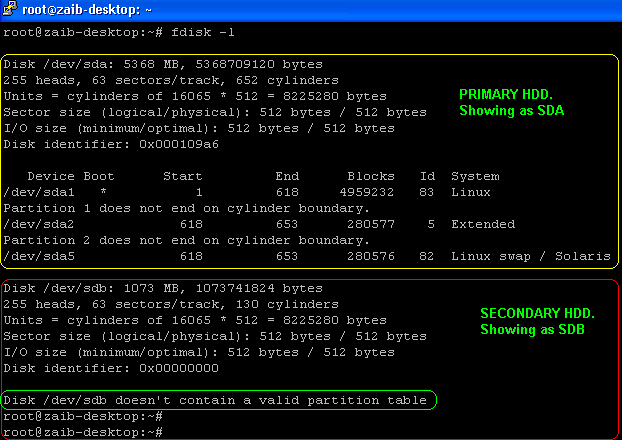 This Guide iwll show you how to add second harddrive to your Ubuntu box. After pluggin in new HDD to ubuntu box, go into your computer’s BIOS and make sure it is detected there properly. From ubuntu command prompt , (root access is must) issue the following command. As shown in the image below . . If, on the other hand, there is already data on your new hard drive,(you will see the partitions). Now we need to create partitions on this newly added harddrive. Issue the following command to execute the FDISK procedure. 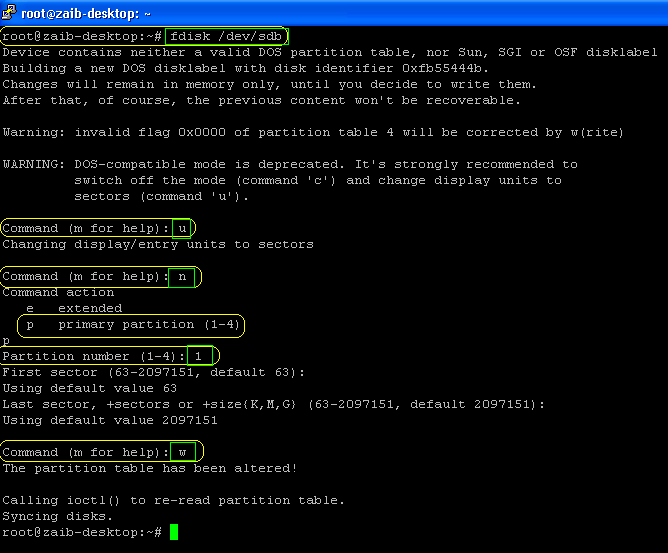 As now the partition is ready to be used , but we have to first mount it any folder. Allow Permission to make this folder writable for every one. Now add the following line at end. Howto install Windows XP from USB Drive? 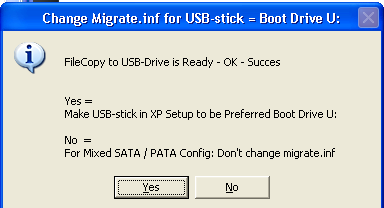 If you want to install Windows XP but your Desktop PC / Laptop has NO CDROM/NETWORK BOOT option , then still you can install Windows XP using USB Disk. 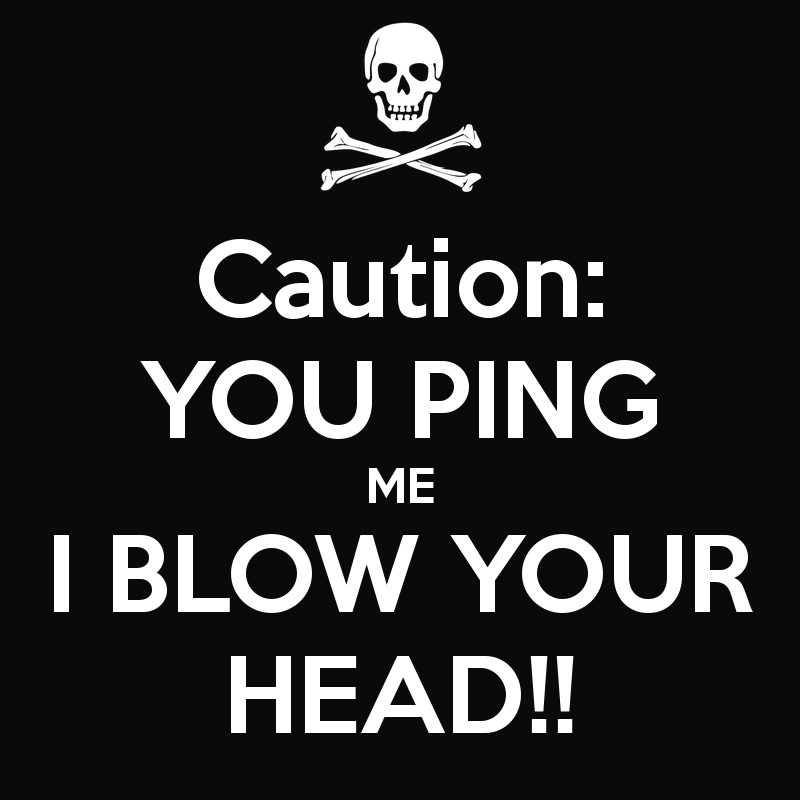 Its simple and handy in many situations. Specially for network / hardware support personnel because USB have added benefits. You can add / remove several apps on the fly from usb. But unfortunately for some reasons, it didn’t worked out for me . 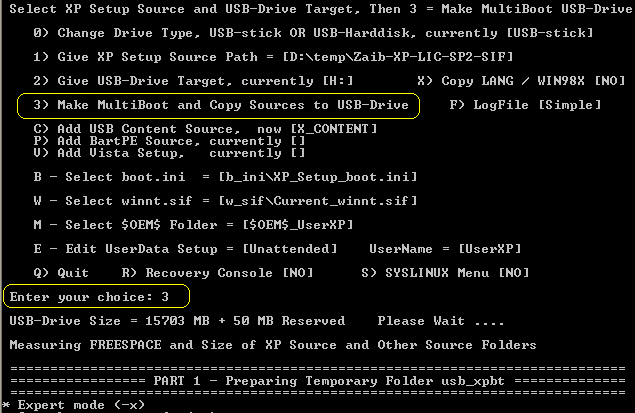 So I decided to go with the USB_MULTIBOOT, In this example I am using the same. Here We Start . . .
You will need a special tool name USB_MULTIBOOT that will copy xp cd to usb and enable the Usb to boot Windows XP setup. Run USB_MultiBoot_10.cmd from your the folder. 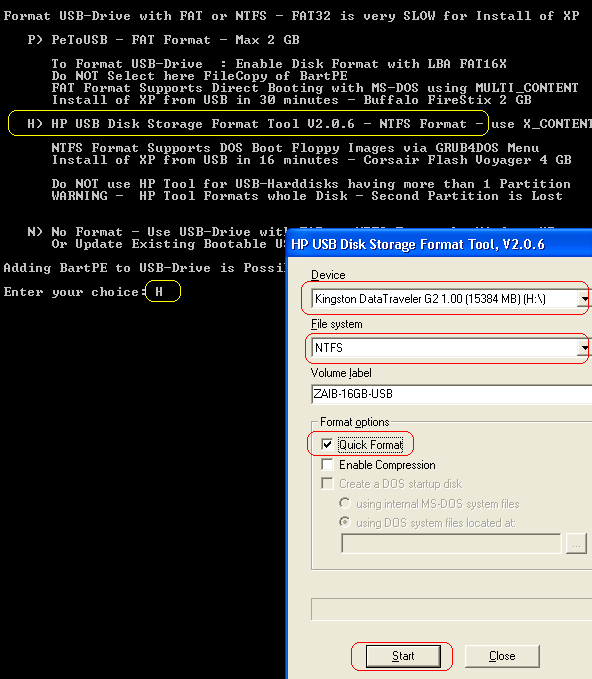 Format Utility will appear, Select ‘ H ‘ , It will then give you several options to choose. Select the following. without problems. 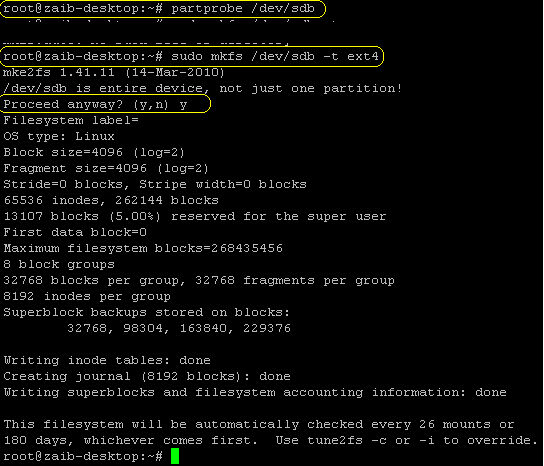 This can be useful as more systems can read FAT32 than NTFS. 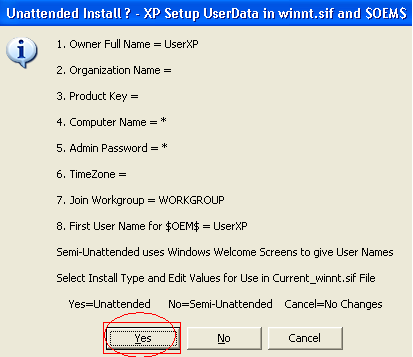 It will ask you to whether you want to install XP in Un-Attendend mode, which means that it will auto enter the required info during the setup installation like User names / Windows XP CD KEY / TimeZone etc. 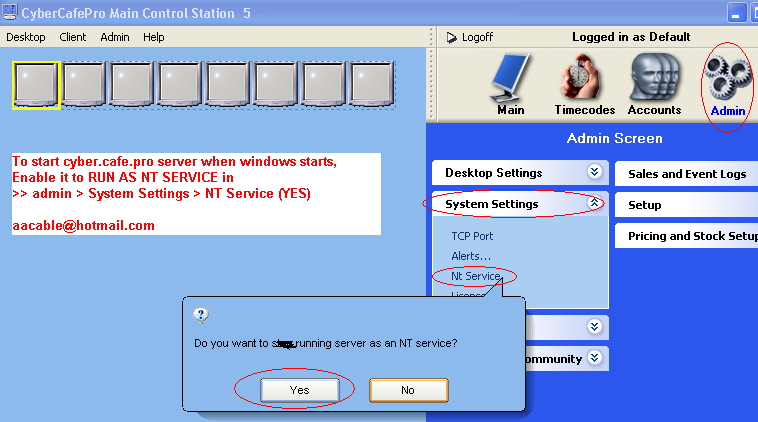 Select YES and enter the required info like User Name CD Key etc. Follow the on screen instructions. Now select option # 3 [Make MultiBoot and Copy Source] to start the setup copy process. After this It will start copying XP files to USB and will perform necessary actions to make it Bootable. ALL DONE. Your USB – Drive is ready for Booting. Plug it to your computer and in BIOS select USB in first boot device. 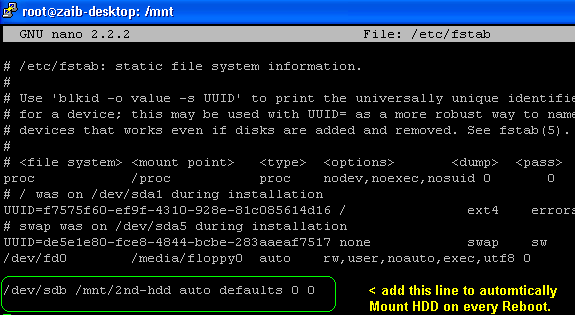 After booting from USB you will see boot menu of usb , Something Like below image. and GUI INSTALLATION AFTER REBOOT TWICE ! 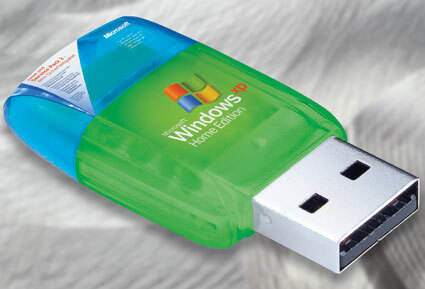 As soon as you arrive at the Windows XP Desktop you can safely remove the USB Drive. IMPORTANT! DO NOT REMOVE USB STICK UNTIL YOU’LL SEE XP’s FINAL LOGIN SCREEN! 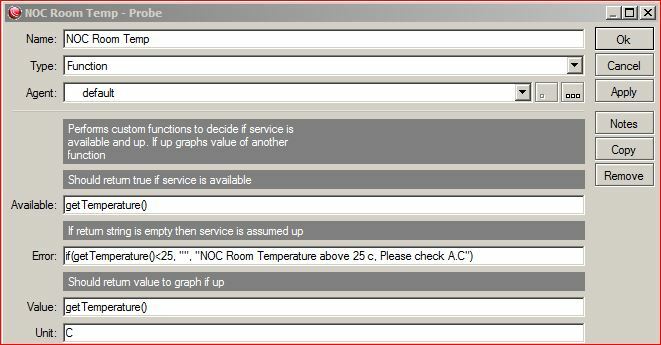 I recently deployed Mikrotik base hotspot system at a customer’s internet cafe but It was missing something which was “Control over the client system, better time management system, on the fly changing in time limit, & anti theft system “. 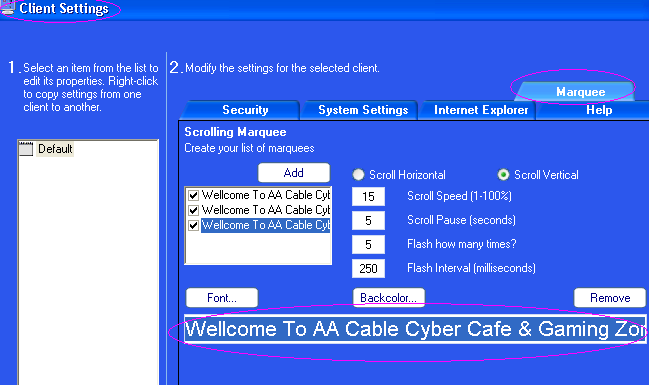 then Cybercafe pro name popped up in my mind. I used this tool many years back in a gaming zone at Gulshan-e-Iqbal. 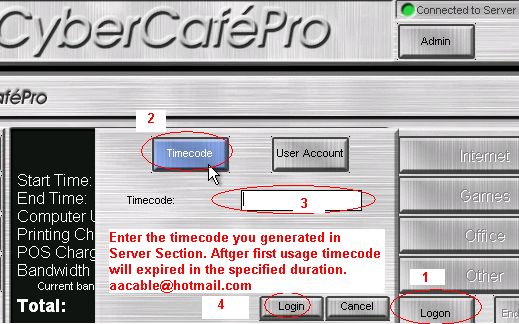 Cyber Cafe Pro is a very powerful user time management base application/server for internet cafe base business. Its a server / client base system. 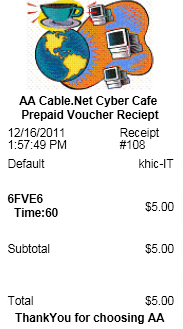 You can create per-paid time codes / vouchers or User accounts. There are two major components of this application. Install this module to the computer which will be used as the front-desk or Main Control Station. IT can be Windows 7/Vista/XP/2003 . Install this module to ALL the computers which will be used by customers. 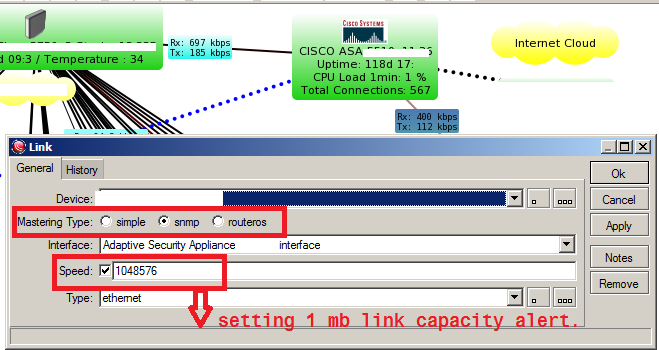 Upon installation, it will automatically detect CCP Server running on the LAN. Otherwise you can manually set it via using CCP Client application. Click on Login to activate MCS. Now Its time to configure CCP Server configuration. First we will adjust “Client Settings” . Now you will be presented with CLIENT SETTINGS Panel where you can adjust / configure many client side tweaks. 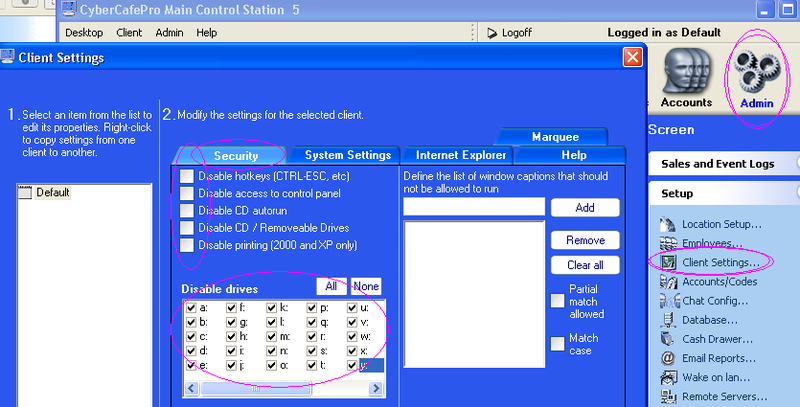 Here at SECURITY TAB, You can adjust many functions like Disable Hotkeys/CD/Drives/Control panel Access etc. 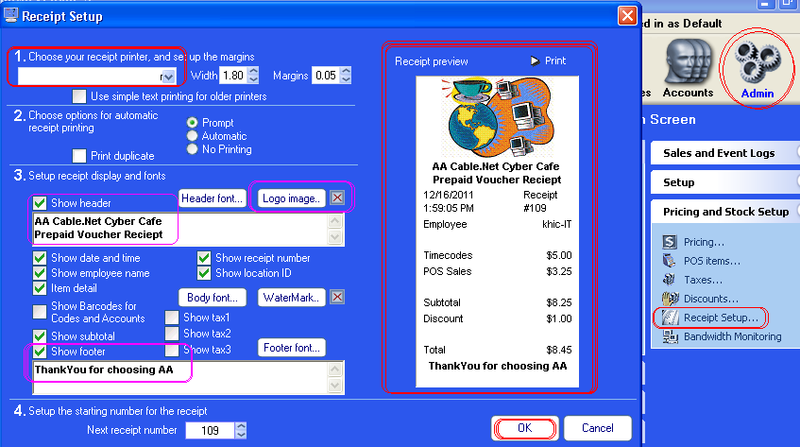 Choose the options as shown in the image below, later you can fine tune them as per your requirements. Now Go to “System Settings“, here you can allow/restrict some options like Startup Folders/Lock , reboot computer at end of session / etc. Also here you can restrict login types. Either Timecodes or User Account. 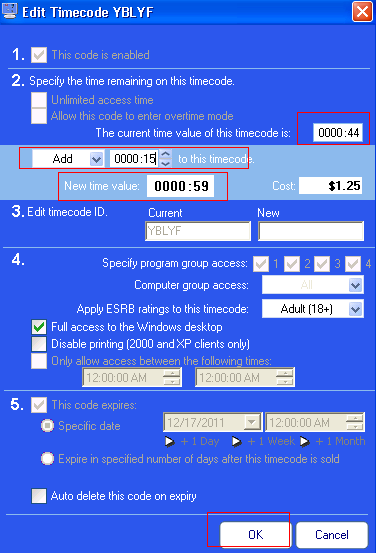 In this example We will chose TIMECODES. 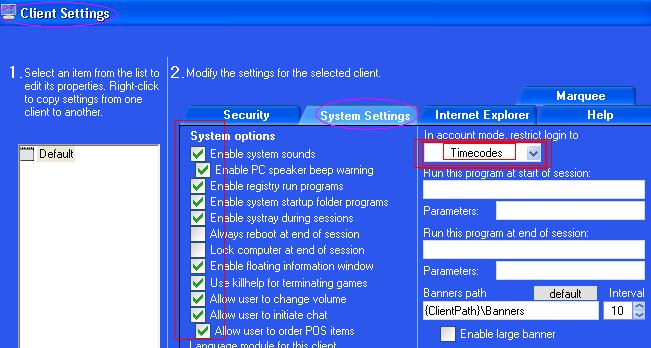 Time-code is a per-paid 5 Digits code (code length number can be extend) which client can use for login. 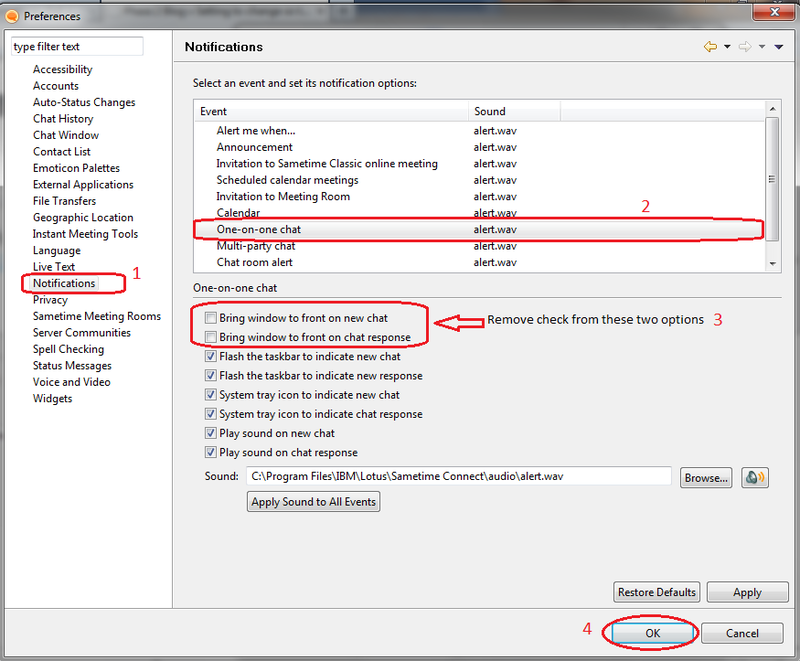 Choose the options as shown in the image below, later you can fine tune them as per your requirements. Now goto “Marquee” tab, Here you can add you banner text, which will be displayed at client side login screen. Its for advertisement purpose as shown in the image below. Basic configuration for client is done. It’s time to Generate prepaid Timecodes . 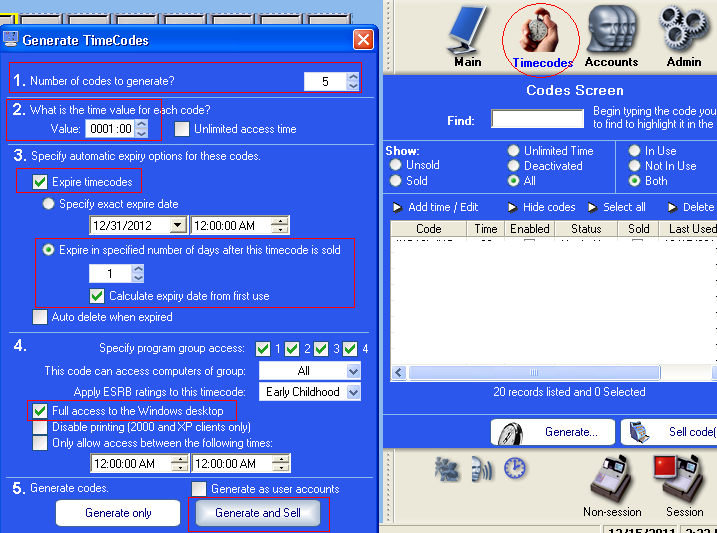 Goto TIEMCODES & click on GENERATE, You will be then presented with a new Panel of “GENERATE TIMECODES“. 3# Automatic Expiry: Here its absolutely upto you how you want to handle this option. In this example I have selected “Expired in specific number of days after this timecode is sold” Which means that When I will sell the code, it will auto expires after one day after 1st usage , It’s necessary to do so this ID it may not be used again and again. 4# Just Select “Full access to the windows desktop. So that when user logon via CCP Cleint module, he will be presented with the WINDOWS XP Desktop access after few seconds. 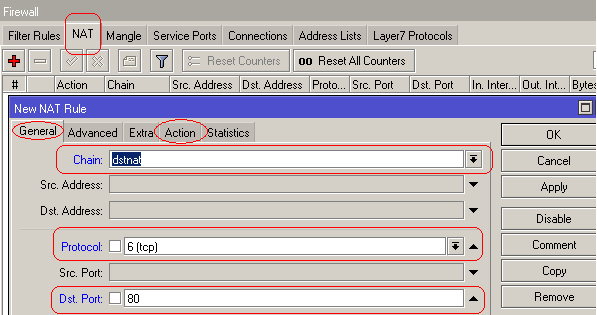 IF you don’t want to provide him with the desktop access, you have to create sets of allowed applicaiton in CCP Client admin section , user will see the panel list from where he can access only allowed apps. Now click GENERATE AND SELL. ( If you select only Generate, it will not be marked ACTIVE (User wont be able to use it), so when you give this code to any client, you have to right click on the code and select SELL CODES to make it ACTIVE. Basic configuration with timecodes is ready at server end. Moving to client end section. 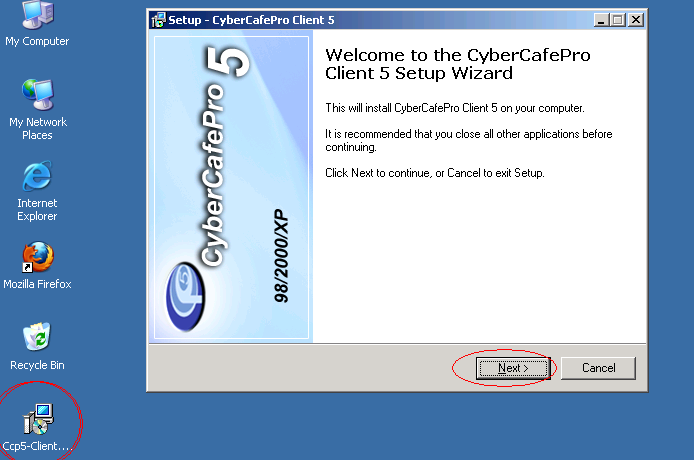 At client pc, Install Ccp5-Client.exe, again installation is very simple, just click next next. See the image below. at End of the client setup , Select the following. After this , REBOOT the client pc. 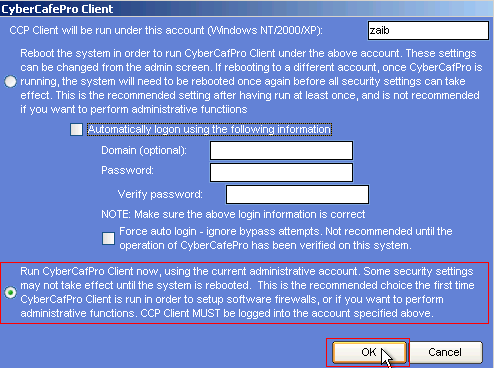 After rebooting, You will see CyBerCafe Pro Client Login Window. NOTE: IF you are unable to click the LOGON button as shown in the above image, then go back to CCP SERVER Main Control Station and you will be seeing one GREEN ICON which indicates that one client PC have been connected with the CCP Server. 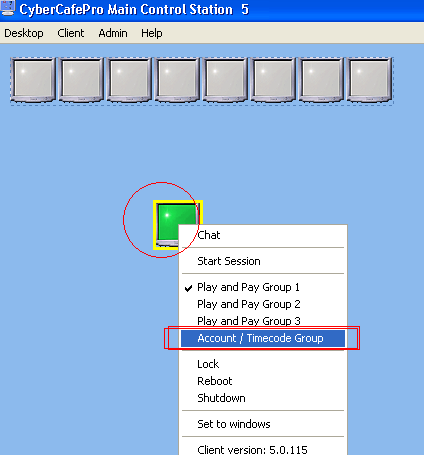 Simply right click on it and select “Account / Timecode Group“. After this you will be able to click LOGON button on client side. After Login, you will see the windows desktop screen after few seconds. If you want to extend the time for any already connected user, then simply follow the below images. 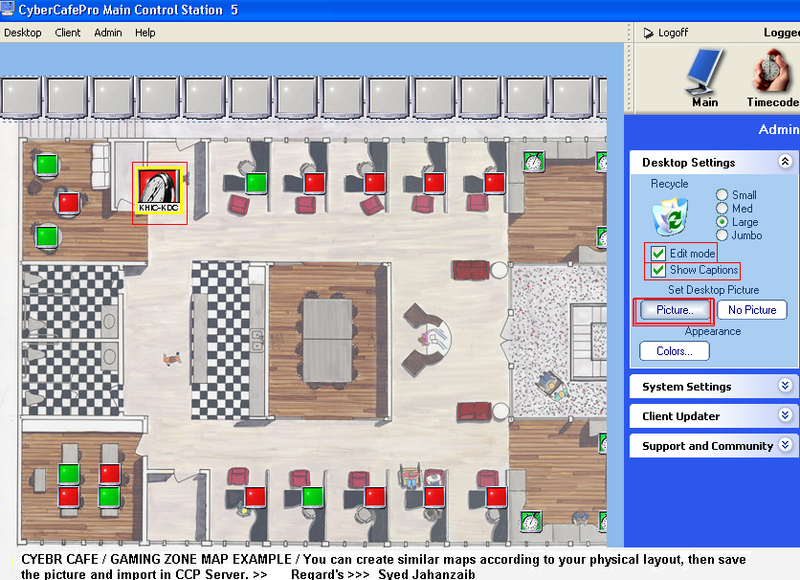 You can create interesting Live MAP of your Cyber Cafe and place your connected pc’s in the MAP as shown in the image below. 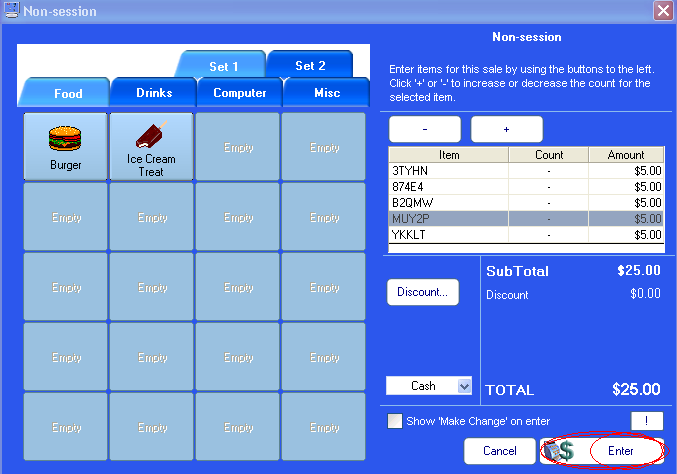 You can then easily Drag n Drop the Pc’s to appropriate location as related to physical layout. I hope you will find this guide very useful and simple to follow. There are lot of things that haven’t been discussed in this article as aim of writing this article was to simply enable the admin to guide on howto install basic version of CCP server with time code generation and howto connect client side PC with CCP server. I will write more info when any requirement will be received. NOTE: Be careful, Dude on router has a big impact on the router CPU resources. It is best to use it on a separate windows base system for more customized control. What is THE DUDE ? The Dude is a free Monitoring application by MikroTik, which can dramatically improve the way you manage/monitor your network environment. 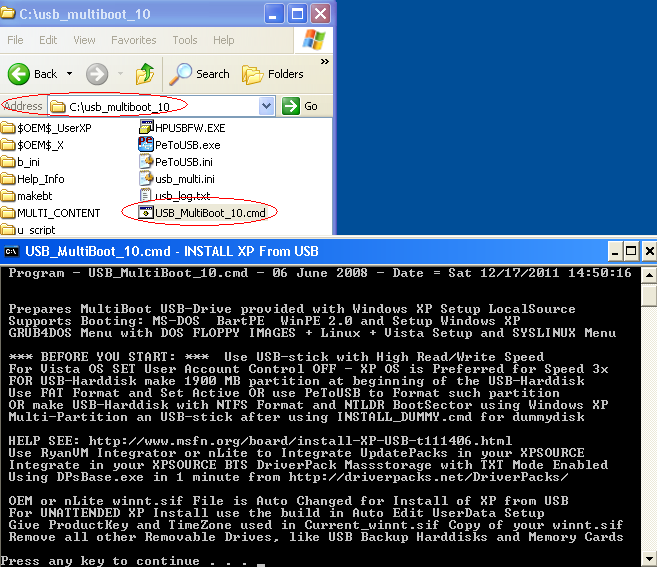 You can Install the DUDE on your Windows PC , OR you can also install it on your Mikrotik x86/RouterBoard. After download simply execute the .exe file and it will install it just like any other simple application.If you have install it on PC, you can start by going to START / Programs / The due. Now you will The Dude main screen. 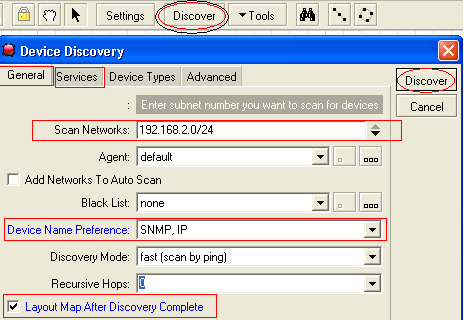 Just for an example, I will add simple Network by using Auto DISCOVERY. 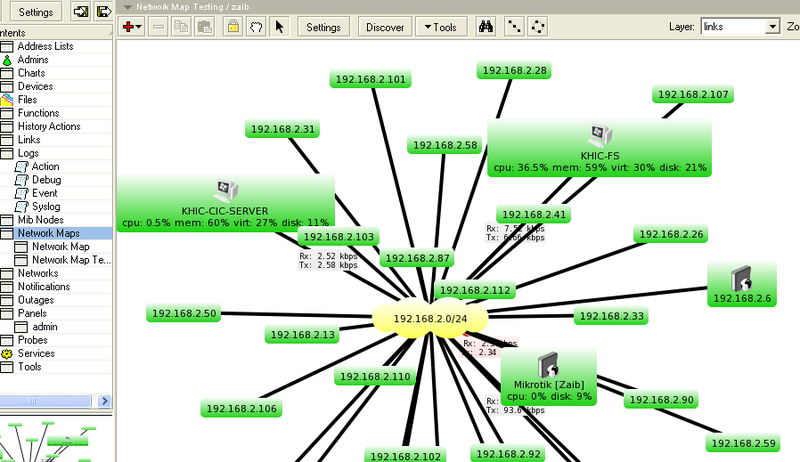 You can later create your own desired network MAP once you understand HOW things works in dude. Use your local subnet series. Also click on ‘LAYOUT MAP AFTER DISCOVERY COMPLETE’. Remove un-necessary services from SERVICES menu, so you will not get red icon if the services not found. Its best to install SNMP on all of your servers to get the maximum information like Link usage/CPU/Memory/HDD etc etc. After it will completes the discovery, it will create a automatic layout map, Something similar to below image. 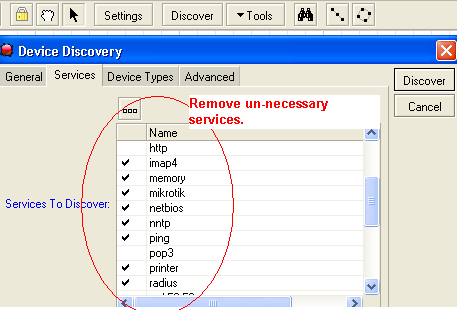 If you are unable to see any PC , Try adding few ips manually. 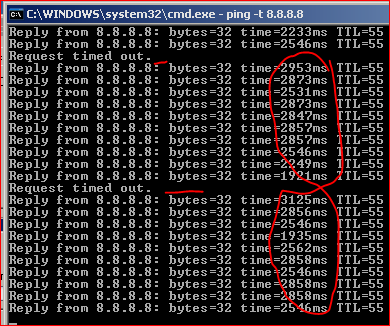 If target pc ping/icmp is blocked, then you won’t be able to see any PC in the graphs, so its better to use another approach /combination on “Device name preferences”. Also check your mikrotik / target pc firewall configuration. Sometimes You would like to add only few targeted devices / computers on your network to be monitored via dude. To do so follow the instructions showed in the below screenshots. 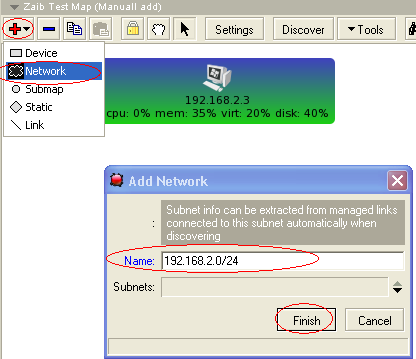 On the Network MAP screen, Click on + sign, then select Device. 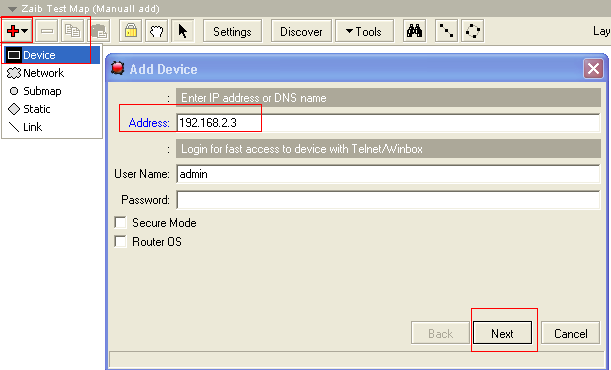 Now enter IP address of your target device and click NEXT. Now select DISCOVER to check what services target device is offering for monitoring. Now add another device as shown in above images. Now add Network ICON so that we can connect both devices for link monitoring. 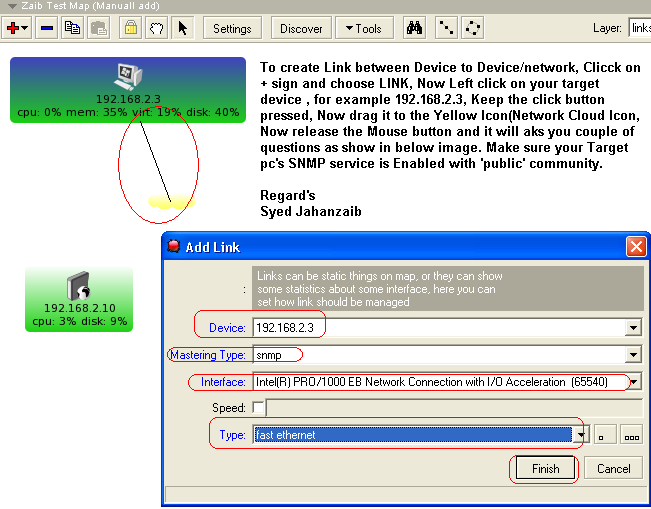 Now the real part, Again Click on + sign and click LINK to create link between device and network icon. You can also View/Controll Dude via web browser. This is convenient if you have fix public ip on your mikrotik / pc where due is hosted, you can monitor your network all over globe using browser only. First you have to enable Web Service in DUDE. Make sure there is no other web server running on your pc/mikrotik. If so, please change the port in above image to something different , example 1234. Now open your browser and point it to your dude server. It will ask id password, Enter your credentials. (First time dude installation have no password, just enter use admin without any password, and then you can change password from ADMIN section. 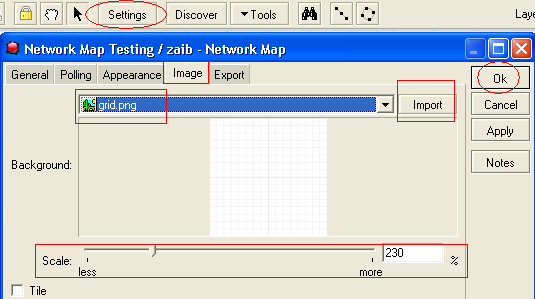 Now click on MAPS > Network Map & you will be redirected to your network map. See the below image. If you want to monitor link bandwidth usage, and you want to configure that if the link is used fully its color should be changed as showed in the image below . . . 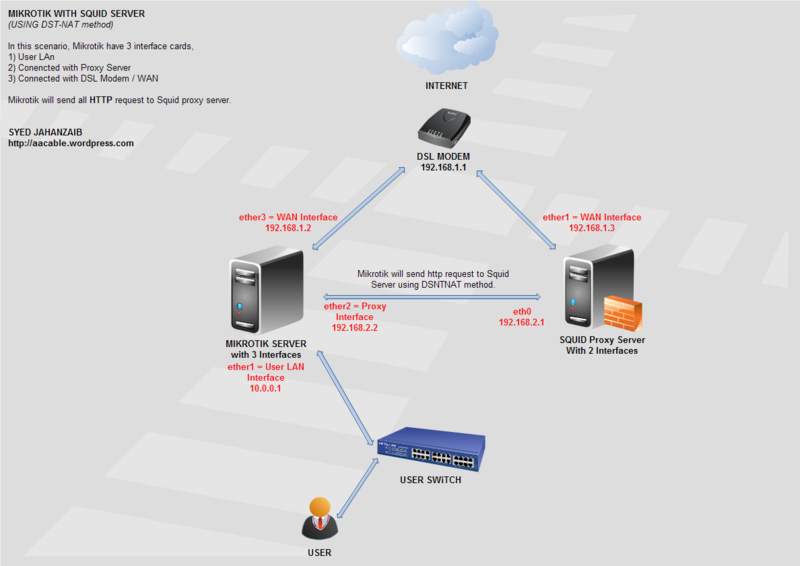 Some of the examples are taken from the Mikrotik DUDE forum. I will add more snaps and info of some live networks where I deployed this beautiful tool. NOTE: The OID for the C: drive can be different on your system , it depends on the drives you have in your system, for example I used the 1.3.6.1.2.1.25.2.3.1.6.1 , but you may have 1.3.6.1.2.1.25.2.3.1.6.2 , so its better to check it in snmp section of device properties. Create New FUNCTION and tag it with your required target device. Note: Replace notes2.exe with your require file’s name you want to monitor. The name is case-sensitive! Write the full file name the same as you see it in the Windows Task Manager List. Create New Probe and tag it with your required target device. Note: Replace Telnet with the service name your want to monitor. Type the full name of the service you see in the services console. The name may be case-sensitive! Write the file name the same as you see it in the Services Console. 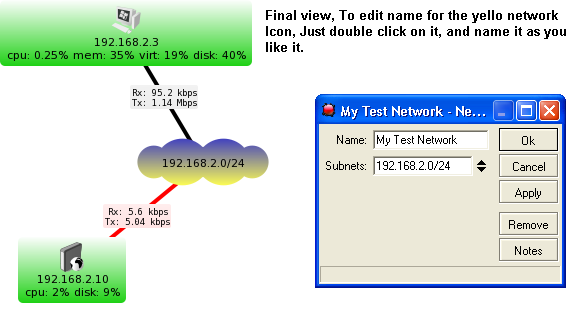 and if you want to divide the snmp result by 100 , then you have to first create function like following. then create a probe with following data. 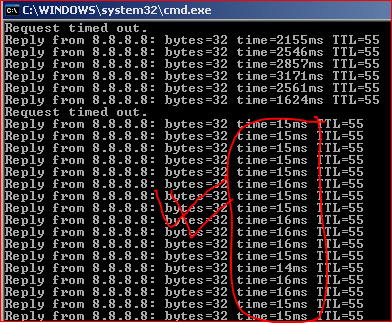 If you want to monitor any device ping delay ms, for example if ping ms delay to any internet link increases above 600 ms , then it should alert, use the following function/probe. 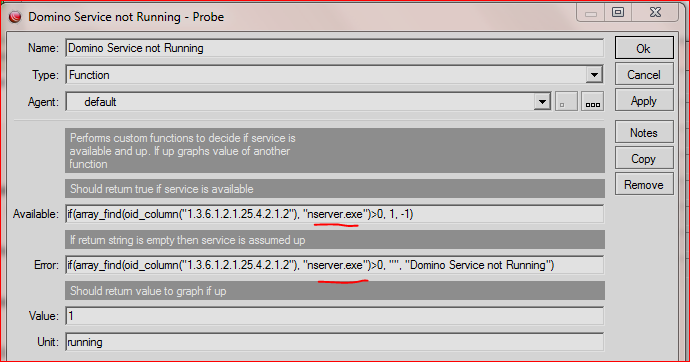 Now create probe and tag the ping_rtt function in it. Now tag it with the device in services section. Howto Send SMS alerts via DUDE. 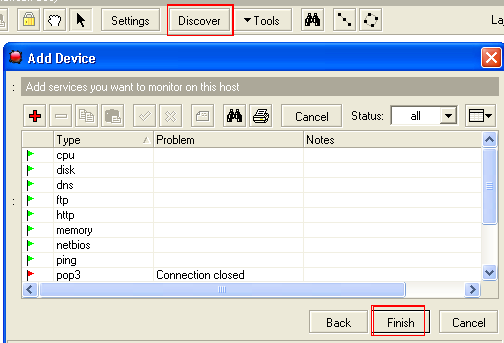 The above rules will disable Mikrotik discovery via winbox, and also it will allow 192.168.2.6 to access Mikrotik. Make sure to change this ip address to match your management pc ip. While I don’t have any problem when some very low sized network or individuals use unlicensed software when they can’t afford them. I’m personally not comfortable stealing software and it was one of my reasons to eventually move on to Licensed Versions. I’d rather not use a program at all or get by with a more restricted free version than pirate it. I would consider making an exception for tools that are outrageously expensive for an individual, like most of Microsoft’s products, but only with the understanding that if a person makes money using those tools, they should eventually pay for them instead of riding the free piracy train. 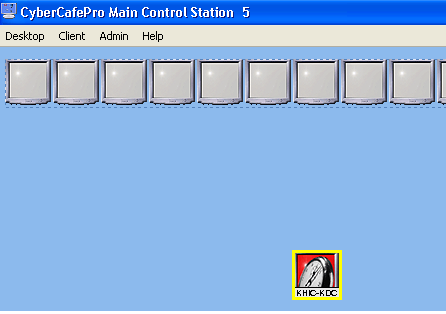 Mikrotik Queuing is heuristic , means every packet leaving mikrotik destined to your IP is capped, even ICMP too. So when you do browsing or downloading any data , there will be less or no bandwidth available for PING/ ICMP packets and ping form client to mikrotik OR to internet will face frequent timeout and high latency in case of full usage of allowed bandwidth. Or if you still want to allow icmp , then simply mark icmp packets and and create a queue that allows more bandwidth to icmp marked packets. # SIMPLE QUEUE approach is valid For both 5.x and 6.x Versions. 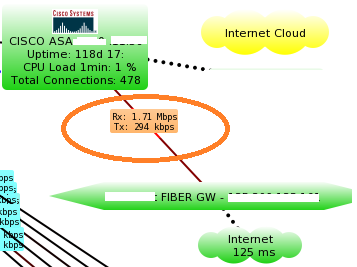 add max-limit=128k/128k name=ICMP_Priority packet-marks=icmp-pkt target=""
Result after implementing above code. 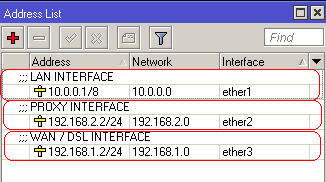 TIP: You can also use PRIORITY base queuing to give priority to ICMP packets from user own queue over other protocols. Few years back, When I joined an company, I saw that there were no proper Documentations, No standard operating procedures (S.O.P’s) available and all the network was quite messed up. So I Decided to Document everything. HERE WE GO . . . . . . . . .
NEW ALLIED ELECTRONICS INDUSTIES (Pvt) Ltd. IT DEPT. Below material is not written by me, it was copied from a book, I don’t exactly remember the link, but I will add it soon, I only edited and make it smaller as per the requirement. Disaster Recovery (DR) is, or should be part of your Business Continuity plan. It is defined as the way of recovering from a disturbance to, or a destructive incident in, your daily Network / operations. In the context of Information Systems and Technology, this means that if an incident completely destroys data, slows down productivity, or causes any other major interruptions of your operations or your business, the process of reverting to normal operations with minimum outage from that incident is called Business Continuity. Disaster Recovery is, or should be, a part of that process. You could say that Business Continuity and Disaster Recovery go hand in hand, but they do vary depending on the area and subject. For example, if your WAN connection goes offline, it means that your business units can no longer communicate via email or internet with each other, although each local unit can still operate and continue to work. This scenario would definitely be outlined in your Business Continuity Plan. However, if your server room burns down in one location, the rebuilding of the server room and the data housed in it would be Disaster Recovery. Why is Disaster Recovery Needed? In most corporations and large organizations, there are people with job titles such as “Network Architect”, “Windows Server Configuration Owner” or “Network Designer“. These people do not have these titles just for fun. In large organizations, there is an actual need for people whose sole purpose is to design or optimize the networking topology according to how technology progresses. There are always new ways of doing things and new designs surfacing in the IT world, and those people need to stay on top of their respective fields. We have understand that DR is an important part of a Business Continuity plan. 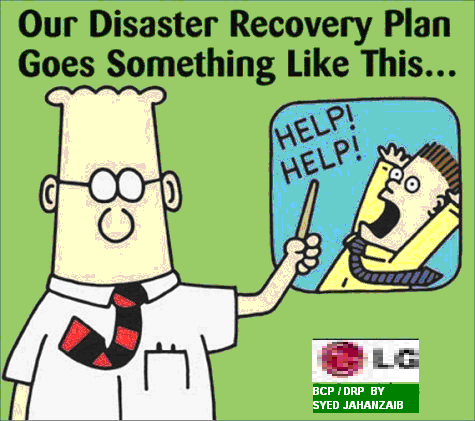 But now, we can go further and say that, DR for AD is only a part of a Disaster Recovery plan, and not the whole plan by itself. You are correct if you think that you should have different DR guides for different things. It is important to take the standpoint that the person who performs the recovery has little or no knowledge of the system. If you roll out your own hardened and customized version of Windows 2003, some things might differ during the installation and someone who has no clear guide will install a system that differs from your actual DC install guidelines. This can cause incompatibility or result in an improperly-functioning system, later on. This happens say, when you have specific policies that are applied to DCs, and during an install process, the selection of policies is called in a manner different from the dictats of the DC policy. You might think that this situation will never arise, but hurricane Katrina in the U.S., and the tsunami that struck Thailand, India, and others, proves that it can. Situations may arise when a knowledgeable person is not around at the time of crisis, so the guide needs to be as clear as possible. It may also be possible that the person doing the actual recovery is an external IT consultant or junior IT staff member because the senior and trained staff are not available. In this case, the person handling the recovery may not at familiar with your environment all be. AD is a great system, but it is also very complex. Performing correct DR is therefore crucial. If AD forms a part of, or is the backbone of, your network and IT infrastructure, a proper guide to bringing it back online in the event of an incident needs to be as clear and concise as possible. The Business Continuity plan, and the DR guides, especially the AD DR guides, should be practiced and tested at regular intervals. This effectively means that once a year or so, you need to test that your guides are working and that they will actually bring your business back online. In order to test all kinds of scenarios, building a test environment—preferably virtualized because it gives you much more flexibility such as rollbacks and snapshots—is a necessity. It may be difficult to convince the top management that your systems could actually fail, but replicating your systems, or even just a crucial portion of your server infrastructure, and testing that would definitely be acceptable to them. Documentation seems to be a problem in many companies and is usually the component in a project that is most often overlooked. Every time that either a new employee starts or an external contractor is hired for an AD related project, instead of getting a binder with proper documentation, he or she is assigned a buddy who explains the systems and infrastructure. Then, the first new task is to write the documentation that has been missing for the last X years. However, after the first week he or she realizes there is not enough information and when they ask for it, they get some vague pointers on where to look. Unfortunately, the usual circle is that documentation is left for later stages in the project, and over time gets forgotten or information is passed on by word of mouth, or as a collection of links to websites, instead. Over time, the missing or incomplete documentation becomes a costly burden to the organization knowledge is lost and, because of its non-existence, is impossible to back up. The eventual creation of this documentation, which wouldn’t have taken that much time to begin with, is a lengthy and expensive process. Documentation is not really that hard to do, but it can be hard to convince your project or program manager allocate the extra time in order to complete it. Usually, the questions will arise as to why this needs to be done now and cannot be done later. A good argument for this kind of questioning would be to explain to him or her that at a later time, information is no longer fresh and remembered, or that it is necessary for backtracking problems. I have found that both of these work very well and generally managers will give you time to document properly. If, however, you don’t get the time, please make sure that you obtain written confirmation regarding the project or program managers acceptance that there is no way of knowing what has been done, and no time to write proper documentation. Getting documentation done is actually quite easy. It comprises two steps, and once you have done this a couple of times, it will flow easily and you will produce documentation that your manager will actually be proud to show around. Presentation page A plain page containing nothing but the title of the document, the department, and the name of the author. A version table at the bottom of the page is optional. Index A proper index table. This should be on its own page and will make it look more professional. Purpose This describes, in a short paragraph, what this document is about. Content All of the actions you took with detailed descriptions. Screenshots are a big winner here. Also make sure you separate different subjects with headers. If you write a document about what group policies you are currently applying, then any change needs to be reflected in that document for it to beup-to-date. Documentation plays a big part in disaster recovery, and sitting having afreshly-recovered domain, not knowing some of the settings that were applied earlier that now prevent things from working, dearly-it may even cost you even your job! When writing your DR, please make sure that you have a printed copy in each location and at least one offsite copy per location. In some companies, it is standard practice for the domain or Enterprise admin at least to have a printed copy at home or on a USB key with him or her at all times. It is also good practice to have a printed copy or an electronic copy in the location’s safe so that it can be retrieved very quickly. Write your documents regarding your infrastructure as clearly as possible, and do not make any assumptions about who will be reading the documents. It could very well be a summer worker or a trainee, although very often companies rely on professional DR-specialized companies. Some of these companies not only do regular, twice a year, complete DR in an isolated environment, but also sometimes provide you with warm sites to get your infrastructure back up and running more quickly. However, you never know what the disaster situation will be and if it is bad, you will want to ensure that everything possible is provided in the instructions. A lot of people assume that a Disaster Recovery guide (DRG) explains reasonably well what needs to be done to get systems back online. This is absolutely wrong. The first question that this assumption could raise is, why would one superficially touch the subject when you are writing a guide already? The second question could be that one never knows who will do the actual recovery. This statement is something that quite a few administrators that I know smiled over so at. The most compelling arguments, however are that someone technical is always around and that a non-technical person is unlikely to perform the recovery. While both arguments have their validity, the risk of a non-technical person restoring one of the mission-critical systems and clicking the wrong button in the process, is just too high. Even if it takes a few more hours to write a proper guide, it can save days during system recovery. The key to a successful and well-implemented DRG is motivation. If there is no motivation from the management and no motivation from the actual technical personnel, then it is not possible to develop a well-implemented and functional DRG. The all-too-common problem, though, is that the motivation usually comes in the form of an incident where a DRG would have helped but was not available. Business Continuity Plans are, as mentioned earlier, high-level documents and procedures. These should always accompany Disaster Recovery guides. A BCP can be created for the Active Directory as well, and the sample in Appendix can help us get started. But in order to create one, we need to have a clear view of our infrastructure and what impact any outage has on our business. The key thing that needs to be done is to define the acceptable downtime and recovery time. The communications department should also be involved in this process so that the right communications channels and responsibilities are used and defined. Communications, within the company and with external entities, can be crucial in the event of a disaster if an organization has responsibilities to investors or is in collaboration with partners. Setting and defining the right channels and processes for company personnel helps to mitigate the outage because users will then know that there is an issue and that the IT department is working on it. They won’t bombard you with phone calls complaining that they cannot work properly. The second important thing, though no less critical, is to define a call tree. We need to have a complete contact list and an escalation path clearly defined in our BCP. The communications department also needs to be involved in this. The call tree is a diagram with different levels of escalation, with the responsible person and phone number listed. With this, it is easy for someone to follow the chain of command and understand who needs to give the go-ahead for a certain action. During an outage or disaster, the communications department should take responsibility for communicating the issue to the entire workforce, and not just the technical staff. For example, the information bulletin could state that the IT department is aware of the problem and is working on solving it, and also give a rough estimate of the time within which the problem is expected to be fixed and normal operations resumed. The BCP needs to be clearly understandable and well written, because in the event of a disaster, confusing instructions can hardly be helpful. Once the final draft is ready, it would be best to have the communications department or technical writer(s) go over it to ensure an easily-readable yet professional-looking BCP. This is a step that should be done by someone who has good presentation skills and an in-depth knowledge of the BCP that was designed. It is also a “two-part step” because the project has to get going start before the final draft can be approved. In order to clear this process with the management, the importance and the consequences of the BCP have to be communicated to them in anon-threatening manner. Often, people who were deeply involved in the design of the BCP and the DRP failed in making it official due to their lack of presentation skills and “social connectivity”. Explaining in detail what we are trying to achieve and why it is crucial for the organization is essential. Once the process has been cleared and has received the go-ahead for creation of the BCP, we must proceed to the next step, and then come back to this step later. Ultimately, it is in the best interest of the organization to have a proper DRP. Obtaining management clearance, and therefore being able to make the BCP and DRP an official standard in the organization, can open a lot of doors for you in the acceptance department. Whenever you hear complaints regarding the implementation, or disagreements in terms of content or testing, you can point to the directive and say: “take your complaints up to the next level“. Nine times out of ten, the discussion ends at that point. This step is an important one because the people who have been delegated responsibilities are also accountable for them. This might not be what some people want, so the roles and responsibilities have to be discussed with the staff to ensure that they understand the implications of them. A clear list of contacts and their roles in the BCP and DRG should be drawn up. This is not a step to be rushed. Make sure that everyone involved, including the managers, know what they are supposed to be doing when push comes to shove. Also important here is the on-call role. Someone from the IT department should always be contactable. Rotation of this role, as well as adequate compensation for this duty, need to be clearly defined. The on-call person needs to have a clear understanding of what steps to take when something happens, and how he or she can determine whether this needs to be escalated or not. 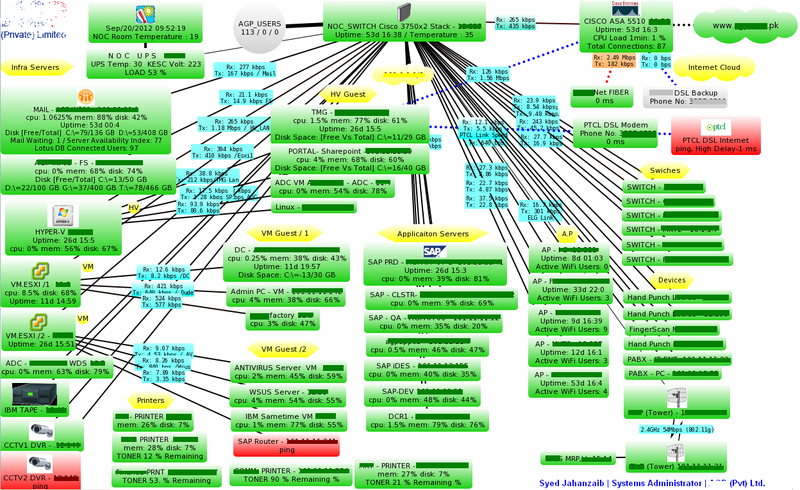 Once everyone is on board and clear with their responsibilities, we need to put this into a visual form, a call tree. Many people, especially a lot of technical staff, complain about presenting things visually. & lot of professionals agree that a visual representation helps immensely in understanding a process, a visual representation of that process helps immensely. When you then read the text regarding that representation, most likely you will understand and memorize the process steps easier. To get a clear picture of what roles and responsibilities should be included in the BCP of LG N.A.E, see the following table. This example gives an overview of who should be included. This has happened twice in companies that I worked with like Fariya Netoworks . They had invested a lot of money into a DRP process and tested it once. They passed with flying colors, but the man in charge (in this example, me) subsequently left the company. The DRP was put on ice because no one took the responsibility and even worse, the whole plan got “lost”. At Some places , When First , I asked for the BCP and DRP, I got a blank face saying: “Well, we have it somewhere”. Eventually, someone dug up a draft version from their archived inbox. After 2 weeks of searching, I found the actual plan in an obscure and forgotten place on their intranet. Not really a good thing. Please make sure that the location of the DRP is well known. Make a section in your IT pages in your intranet, print it out, and hand it to everyone, and always mail the latest version to the people involved. An off-site, updated, copy of the DRP and all its related documents, along with copies of software that is running in your organization, is absolutely critical. The process of keeping the DRP off-site in printed form and possibly also in electronic form is likely going to be an enormous time and money saver. This way, many copies will be around in case of an emergency. Define the Order of Restoration for Different Systems (Internet Servers / Domaind Controller / ADC / Mail Servers then Add One Server etc. The contents to be recovered and their order of recovery should be clearly defined in the DRP and the BCP. (This means, first the root DC in the hub site, then the first Domain Controller, then the second, then one at a regional sites, and so on.) Also to ensure internet connectivity you must have backup liens and proxy servers ready. This is the final step. Once everything is implemented, documented, and tested, go back to the management and tell them that the task is complete. Show them numbers for recovery times, pie charts of possibilities, and maximum outage numbers. Once they are convinced that money was not wasted, get it all approved and standardized. You should be well known by then as “the man” for disaster recovery and your job, in case of an emergency, just got much, much easier. In this presentation, we went through all the steps and processes required to get a DRP implemented successfully. Knowing the correct processes, even if it seems strange and out of place, and then applying these processes can save a lot of additional work, and possibly your job. If you have a trained team and a plan that illustrates every step of the way, your downtime will be minimal and if the downtime is caused by something that you had no control over, such as a natural disaster or someone with a screwdriver in the wrong place, then your management and your company will know what they invested the time, effort and money into. This is by no means a complete guide to implement a DRP but it should definitely point you in the right direction, and a good way there.